Nitish Kumar who is on a week-long Pakistan visit since Friday revealed that he was father of father of Pakistan, Mohammad Ali Jinnah and now took a rebirth as Nitish Kumar. He also told Pakistani awaam that he is ready to give his DNA sample on the spot to prove his claim. "I am ready to give the proof that I was his Abbu jaan. Take my DNA sample on the spot here only and match it with his DNA from his skeleton. In my last birth I was his father and he was my beloved son," said Nitish Kumar in an emotional dialogue with Pakistani politicians and public. A dark and smothering lump in his throat clearly felt while he was expressing that he was the only father of the father of Pakistan, a forefather of current generation of Pakistan. He kissed Mohammad Ali Jinnah's tomb, Mazar-e-Quaid again and again saying I love you my son, at least for 274 times when one Pakistani Minister stopped him and told him that tomb is fully wet now and there is no space to kiss anywhere. With heavy heart he left the tomb as it is which thereafter cleaned by a cleaner. Sobbing Kumar cleaned his wet eyes and told Pakistani people that he was the same guy whom the civilians of Pakistani eagerly trying to find out. "Many people ask me who are the ancestors of Jinnah and how was the father of Jinnah who gave birth to such a wonderful child. I said I am that guy. I had realised it since my birth only that I was his father in my last birth. 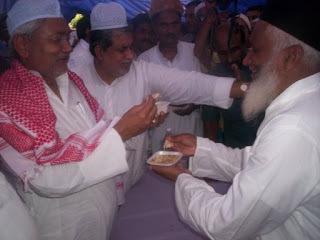 I intentionally came here again to meet him but he left early," said Nitish Kumar just removing few drops from his eyes. While everybody near the tom started muttering, he said "Don't worry, here I give you my blood sample. Take my DNA, it is same that Jinnah had. He is my blood. I came here to fulfill his dream and I am ready to become Pakistani President right now, right at this point of time." Nitish Kumar took a knife from the gun of a security guard just cut his hand and let all the blood flow into a glass and gave it to Pakistan President Asif Ali Zardari and told him "Zardari, immediately go to a doctor and show this sample and match it with Jinnah and prove that I was the same guy who was Abbu jaan."